He was born on October 4, 1542, at Montepulciano, Tuscany, and died September 17, 1621 in Rome. Saint Robert’s parents were Vincenzo Bellarmine and Cinzia Cervini, a niece of Pope Marcellus II. His mother was conspicuous for her piety. Robert was the third of their ten children and was a sickly and frail boy who was educated by the Jesuits, who praised him for his academic performance as well as his sanctity. He entered the Society of Jesus at the age of 18, over the objections of his father, who wanted him to have a career in politics. Because of Robert’s persistent health problems, he was sent from one city to another by his Jesuit superiors in an effort to improve his physical well being. Even before his priestly ordination in 1570, he was appointed to preach in many of these cities. After ordination to the priesthood — again, the year was 1570 — he was appointed professor at the Louvain in Belgium, where he lectured on the works of Saint Thomas Aquinas until 1576. While at Louvain, he became acquainted with a colleague who also taught there, named Michel de Bay, or Baius, in its Latinized form. Baius is famous for being the grandfather, as it were, of the Jansenist heresy, a collection of heretical ideas not too far from Calvinism. Among de Bay’s errors was the denial of free will. Saint Robert Bellarmine took to refuting his colleague, whose errors caused him great alarm. We might see this as heralding Bellarmine’s great future as a Catholic controversialist and polemicist against the errors of his day. As a young professor, Saint Robert taught himself Hebrew and wrote a popular grammar of the Hebrew language. This would be one of numerous illustrations of the man’s prodigious mental abilities. In 1588, he was made the spiritual director of the Roman College, and in that capacity served as the spiritual guide for the last years of Saint Aloysius Gonzaga, who died at that college in 1591. Later, Saint Robert would work on the cause of Saint Aloysius’ beatification. It is a strange thing, but one not entirely unexplained, that Saint Robert was canonized almost two hundred years after Saint Aloysius. In 1602, he was named Archbishop of Capua, where he served in an exemplary manner for three years. The year 1605 witnessed two papal conclaves, owing to the death of Clement VIII followed by the 26-day papacy of Leo XI. In both of these conclaves, the name of Cardinal Bellarmine was mentioned as papabile, much to the humble Jesuit’s chagrin. But, instead of serving the Church as Pope, he rather served the new Pope, Paul V, in a number of official capacities. These offices forced him to stay in Rome, so the zealous shepherd was relieved of his duties as Archbishop of Capua, at his own insistence, because he did not want to be a negligent pastor of souls. It should be recalled that the non-residence (or absence) of bishops, pastors, abbots, and other clerical office-holders was an enormous abuse that had only recently been corrected by the sixth session of the Council of Trent, which made Ecclesiastical Residence mandatory. This abuse is often considered one of the causes of the Protestant Revolt. As both Bishop and Cardinal, Saint Robert would have been exempted from the strict observance of poverty that was required of Jesuit religious. However, he insisted on staying in a Jesuit house, and, when his room was supplied with elaborate silk, velvet, and damask wall hangings — because someone thought this office required such finery — he gave them all away so that the poor could keep warm. When questioned on his bare walls, he replied: “the walls won’t catch cold.” He also insisted on a poor-man’s larder, and ate the food of peasants, consisting mostly of chicory lettuce and garlic. The defense of the papacy against King James I of England. The trial of Giordano Bruno, which he oversaw. The early stages of the Galileo affair. Cardinal Bellarmine helped Saint Francis de Sales obtain approval for the Visitation Order of nuns that he co-founded with Saint Jane Frances de Chantal. Saint Francis de Sales is quoted as having said, “I preached five years in Chablais with no other books than the Bible and the works of the great Bellarmine.” Saint Francis de Sales, in fact, was appointed coadjutor bishop of Geneva after passing a test administered by Saint Robert Bellarmine. At that time, the Cardinal ran an important Roman office that oversaw the appointment of bishops — something to which he attached great importance: Essentially he was continuing the reforms of the still recent Council of Trent in seeing to it that good Bishops were appointed. Saint Robert died on September 17, 1621. Significantly, that is the feast of the Stigmata of Saint Francis of Assisi — that is, the feast commemorating the impression of Saint Francis with the Five Wounds of Our Lord. Saint Robert had been born on October 4, the main feast of Saint Francis, and he was named Roberto Francesco Romolo Bellarmino, the Francesco part being after the poor man of Assisi. So not only was Saint Robert, the Jesuit, personally dedicated to the founder of the Franciscans, but the Feast of September 17 — the Stigmata — was also something that he helped to institute in the Church in his capacity as Cardinal Prefect of the Sacred Congregation of Rites. In the Traditional Roman Rite, Saint Robert’s feast is May 13, the anniversary of his Beatification by Pius XI. In the New Rite, which has reduced the significance of the Stigmata of Saint Francis, Saint Robert’s feast day has been moved to September 17. 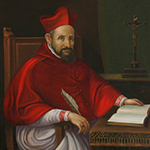 Saint Robert Bellarmine was canonized by Pope Pius XI in 1930, and declared a Doctor of the Universal Church in 1931. He is the patron saint of catechists. We end with the oration for his feast in the traditional rite. It has been made “kinder and gentler” in the new rite. O God, who didst fill blessed Robert, Thy bishop and doctor, with wondrous learning and virtue that he might break the snares of errors and defend the Apostolic See: grant us by his merits and intercession, that we may grow in the love of truth and that the hearts of those in error may return to the unity of Thy Church.